Home NBI NBI Clearance 2018 Updates: How to RENEW an old applicant of 2014 - present NBI Clearances? 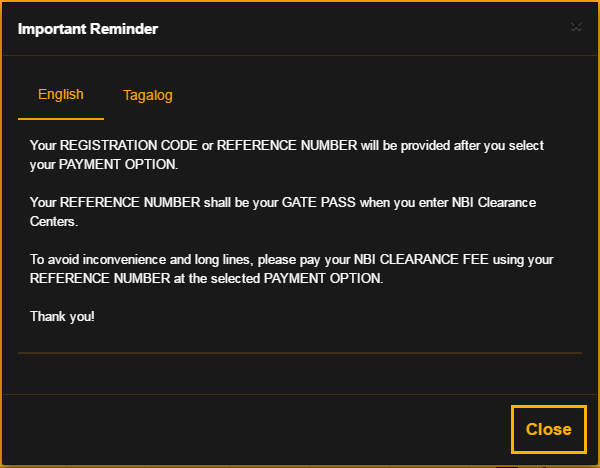 NBI clearance updates and how to RENEW your old clearance. In the first quarter of the month last year 2016,NBI clearance site were updated. As we visited the site again, the webpage updated with new design and color. While the process of NBI application was still the same. Here, the site adds more feature in payment, security and announcement. SECURITY: NBI is implementing additional security, by requiring a PIN CODE per account. The PIN CODE shall be use for Quick Renewal, Delivery Service, and other NBI related services. So, please memorize your PIN CODE and do not disclose to anyone. Reminder: In creating your PIN CODE it must only be a 6 digit number/character. 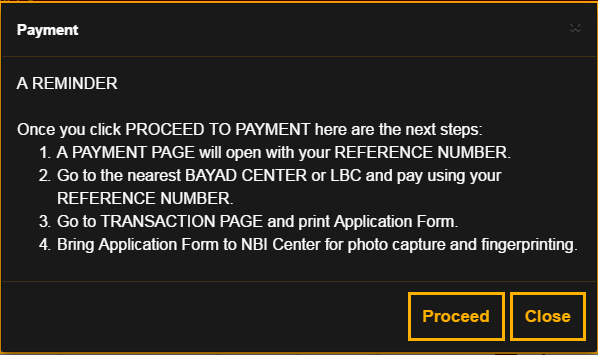 DELIVERY OPTION: This is the latest additional feature you may experience once you've already registered your NEW NBI application online that started in 2014. When you renew, you have another option not only to pick-up your clearance. Aside from that, Delivery option has to choices (the Regular and Express). For Delivery Fee(regular) = 160.00 (NO. OF DAYS WERE NOT YET SPECIFIED) and for Delivery Fee(express) = 200.00 (NO. OF DAYS WERE NOT YET SPECIFIED). Please be advised that NBI site is only available for application/transaction from 6:00AM to 6:00PM only. 2. For with Hit or those pending application due to same name issue and others, if you have no time to go back to NBI to pick up your NBI Clearance. Get it delivered "Door-To-Door"! You may need your numeric PIN Code here. If you have set your pin code with character you may change it by signing in to your NBI account then Under your Profile Name > Change PIN. 5. You need to print your Application Form after you paid the NBI Fee. 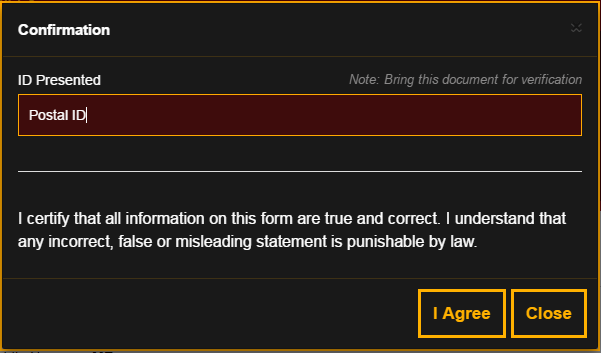 Sign-In > Transaction > Action: DETAILS > Print Application Form Button. Please be reminded that you have also the option to cancel your transaction! Application guide for RENEWING NBI CLEARANCE. (1) Kung may account na online at sa Application > application type = RENEW, deretso mo na i-apply for renewal at ang Delivery option ay avaiable na. - Provide NEW email address and pwd. Note: Can Use imaginary email > Click "Sign UP" then pag-okay na > Sign-in using newly used credential then schedule na for appointment. 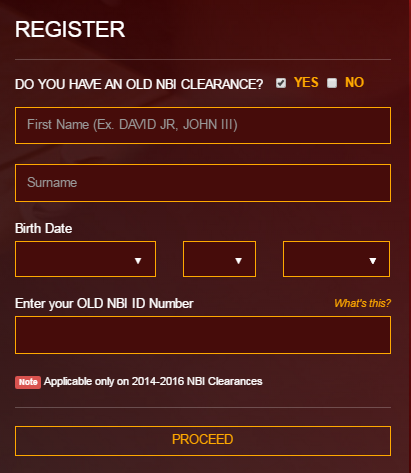 Select YES button from the QUESTION: Do you have an OLD NBI CLEARANCE? Provide the necessary information and input including your OLD NBI ID Number. Click PROCEED. There will be a message "Data successfully retrieve" that will appear from upper right part above the SIGN IN button. Now that your record is retrieved, provide your email-address and password on the blank then Click Sign-Up, the site will redirect to your profile page. However, you may use SIGN IN option by providing your old account used in your first application. NOW apply RENEW your clearance. Clicked APPLY FOR CLEARANCE button, above the EDIT INFORMATION button on the upper right side corner. NOW SET your 6 digit/character PINCODE and remember to save this PINCODE for future use. Complete your application. If you choose DELIVERY on Q: How you would like to get your NBI Clearance? THERE IS NO APPOINTMENT DATE and NO BRANCH IS NEEDED you to provide. HOWEVER, YOU NEED TO FILL-OUT THE RECEIVER’S NAME and COMPLETE ADDRESS and on the other side are PURPOSE DETAILS, DELIVERY TYPE (REGULAR OR EXPRESS) and the PAYMENT OPTION. See sample below using DELIVERY OPTION. 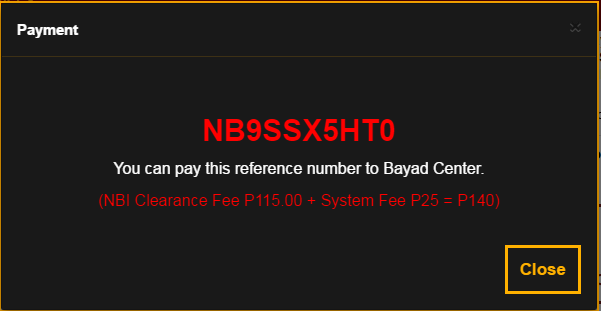 In this example we used BAYAD CENTER as form of payment with REGULAR DELIVERY Fee. You will need this REFERENCE NUMBER upon payment. While if you choose PICK-UP rather than DELIVERY, complete your application by (SELECTING NBI BRANCH, PREFERRED DATE, PURPOSE AND PURPOSE DETAIL, AND THEN PARTICULAR AND AMOUNT IS AUTO-GENERATED AND LAST IS THE PAYMENT OPTION). 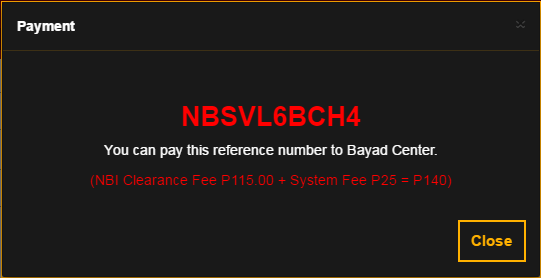 See sample image below using PICKUP DELIVERY and BAYAD CENTER as for of payment. Remember and save this Reference Number. It's DONE. Pay the Fees and come to your appointment date if Pick-up. To see payment instruction just click TRANSACTION on your menu. HOW TO CANCEL PAYMENT TRANSACTION? If you wish to cancel payment, there you are free to cancel your payment. See sample image below. Go to TRANSACTION and you can see the transaction in PENDING. Just click CANCEL Button and the transaction will be labelled Cancelled and when you refresh, will totally removed. LOOKING FOR THE LATEST GUIDE FOR APPLYING NEW NBI CLEARANCE ? 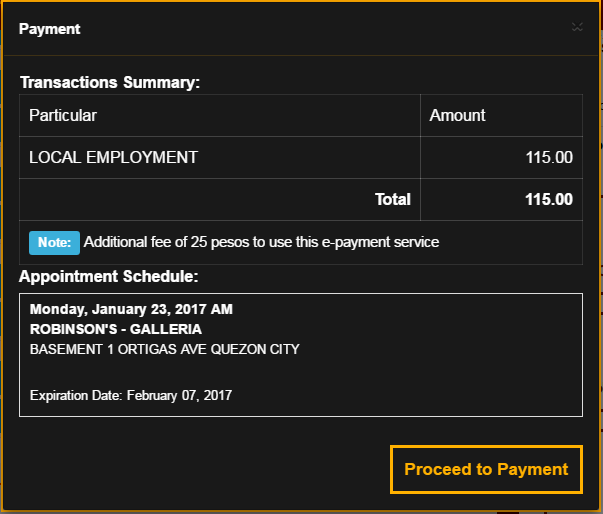 Ako po ay may NBI 2016, pero bakit pinapapunta pa rin ako sa any nbi satellite para dun mag renew. Wala po akong time pumunta kaya gusto ko sana delivery or quick renewal nalang. 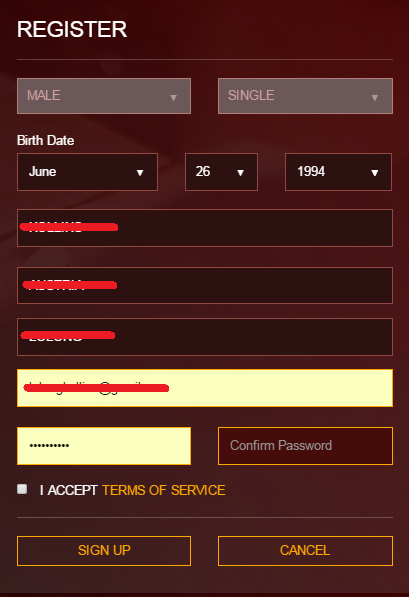 Tumawag po ako sa mobile number na naka display sa site ng nbi, sabi wala na raw po ung PIN CODE. Hi, yung delivery address mo ba is the same with your home address? 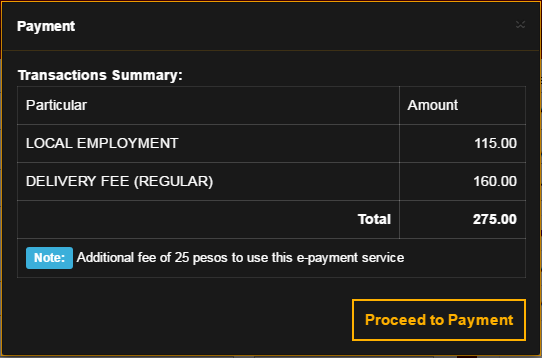 Ilan araw po bago mu natanggap un NBI clearance mu.Kase un sakin till now wala pa rin , payment was settled last 10Sep. Nag renew ako nbi ko at pinili ko yung delivery kailangan ko parin ba pumunta sa nbi? Nagbayad ako sa lbc 355 pesos. nakuha mo na nbi mo?